What do you think about emojis in mobile marketing? ? ? ? Could they be an effective means of getting the attention of an audience? Or will it this approach considered odd, off, bad? Well, apparently for digital marketers emojis offer quite a positive opportunity to connect with their target audiences. The industry medium Horizont last year had a story about a long-term analysis conducted by Leanplum. The result: There’s a well-founded argument for using emojis in mobile marketing. According to the research, open rates on emails increased by 66 per cent when emojis were used. The probability of a recipient opening push messages was up by 254 per cent. These facts pointed to a wider lesson for mobile marketers. Make use of emojis to drive growth and enhance retention. Emojis, thus, are a means of driving direct engagement up. Find out more about the facts of emojis relevant to marketers in this piece by Leanplum’s Joyce Solano. In an older piece on The Next Web, the psychology of emojis was analyzed. The key finding, based on scientific research: When we look at smiley faces online, the same areas in our brains light up as if we were looking at a human. For hands-on advise on the use of emojis, we recommend a short piece by Woop Social published on Medium. They offer a number of ways to include , and in strategic digital messaging. 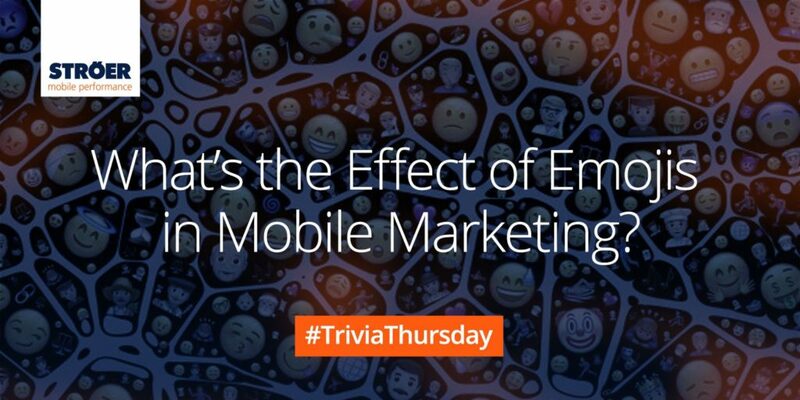 Previous Trivia Thursday: Do you know what CPA, CPI and CPS stand for in mobile marketing?